Whether you're looking for one-of-a-kind entertainment for your wedding or an entertainer for a corporate event, The Magic of George Bradley is the magician to call. For more than 15 years, George Bradley of Silver Spring, Maryland, has provided magic shows around the US, and he looks forward to delighting you and your guests. George will be performing with Wayne Gonce at Everett Theater in Middletown, Delware, on Oct 14-15. Doors open at 6:50pm and the show starts at 7:30pm. The Everett Theater is located at 47 West Main St, Middletown, DE, 19709. Unlike most magicians, George provides magic in two ways: close up or tablehopping and stage shows. During the tablehopping shows, George is close up with your event attendees; however, he's never intrusive during his performance. Your guests are watching inches away as the magic happens right in front of them. Tablehopping magic shows are perfect for weddings while guests sit at the table. During the event, George visits each table and performs a variety of tricks before moving on to showcase his skills to other guests. Stage magic shows are usually for events with 25 to 150 guests; however, he can do shows for audiences of up to 600 people. Guests can even witness the enchanting magic from the back of the hall, as George provides a 10' projector screen for all to see his skills. These rates do not include travel expenses. 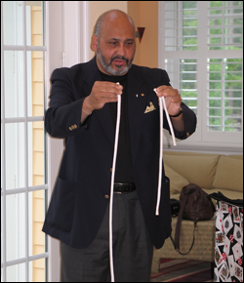 Contact George Bradley to host a magic show that will leave your guests awestruck.